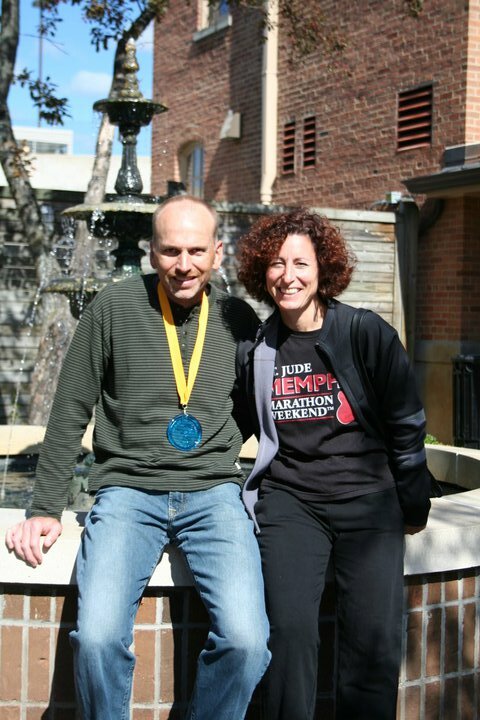 Rebels ran full marathon & entered teams in 3 person relay. 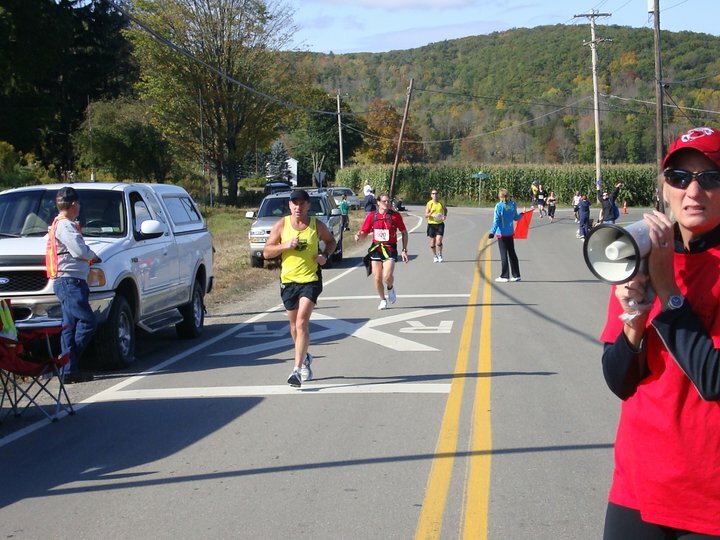 Tuckin's account of weekend trip to upstate NY for a beautiful fall marathon. 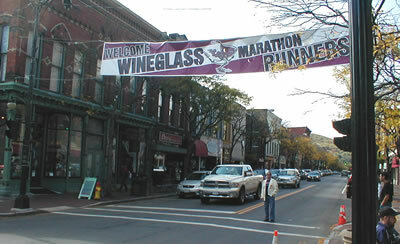 Wineglass is a nice small-town race on a fast point-to-point course at the peak of fall foliage season. 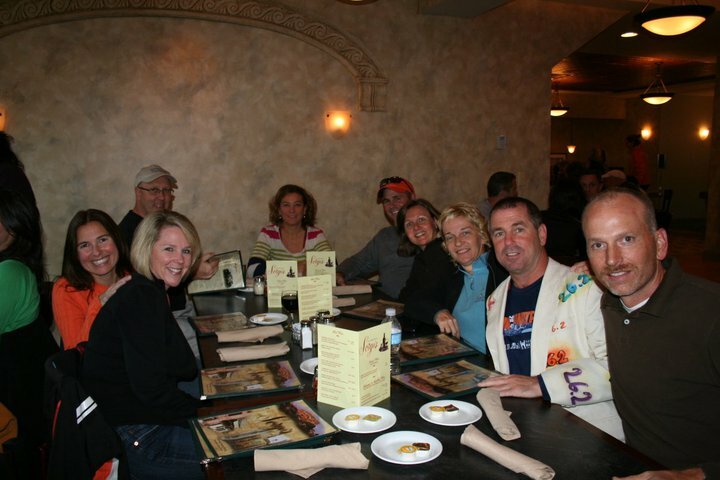 A Rebel combination send-off dinner was held at Lamberti's Cucina for all of the October Marathons, including Wineglass, Chicago, Green Mountain, Steamtown and Kansas City. 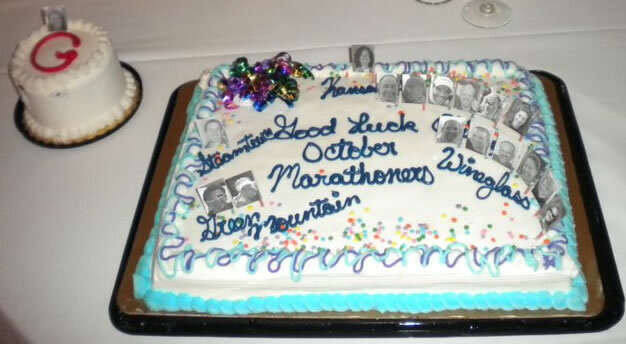 Nearly 30 enjoyed the pasta and traditinal "good luck" cake. 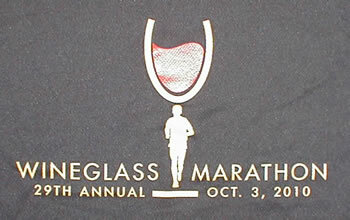 Delaware had a large contingent of runners at the 2010 Wineglass Marathon in Corning, NY. Almost 20 Rebels, family & friends carpooled up on a beautiful Saturday morning, watching the fall colors become more vibrant the farther north we traveled. Rich drove Trish, Dar and myself on the scenic route through the Pennsylvania Dutch country and along the Susquehanna River. We stopped for lunch at a small town restaurant just north of Williamsport, PA. Arriving in Corning in early afternoon, we headed straight for the small, open-air expo where we picked up bibs and the ladies did some serious shopping for Wineglass logo gear. 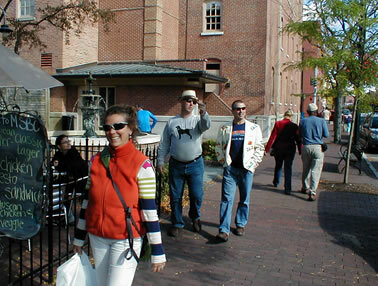 The expo is at the race finish area, a small park near Market Street, which serves as the downtown tourist area, with restaurants, bars, and glass retailers. 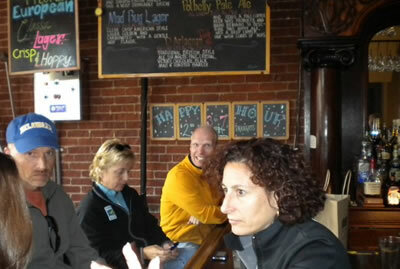 Much of our group re-united at the Market Street Brewing Co. before we drove a mile to Staybridge Suites hotel. 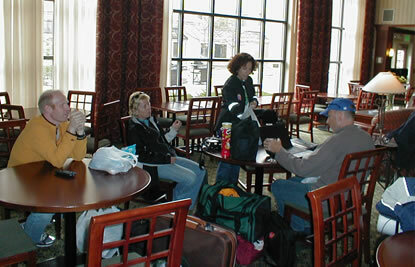 Our stay started out on the wrong foot when we were told that none of our rooms were ready yet, so we camped out in the lobby, waiting for them to become available one by one. 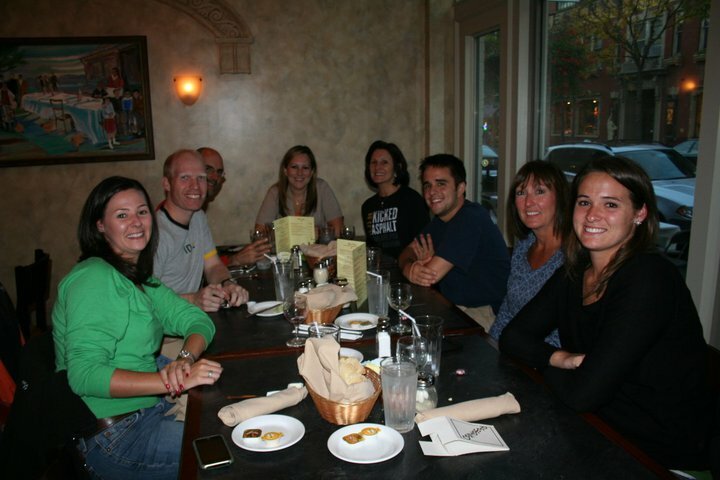 Immediately after placing my bags in the room, I walked back through downtown and up a hill to hit 5pm Mass before doubling back to join our tables of 18 for a nice pasta dinner at Sorge�s on Market Street. 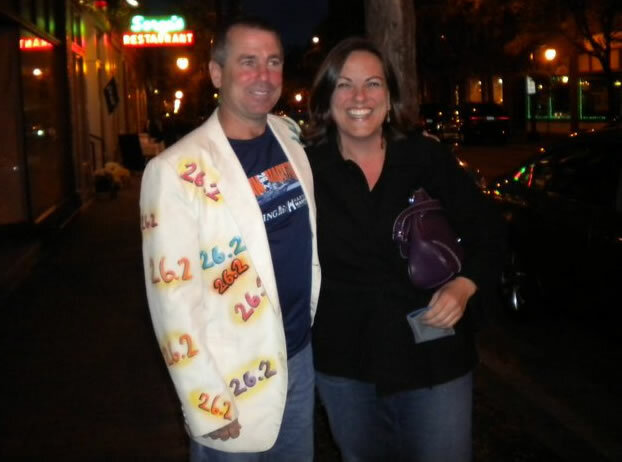 Continuing to wear his 26.2 jacket, Rich posed for several photos with admirers, including a lady who had had her picture taken with him at the [equally small] Breakers Marathon in Rhode Island. He was pumped up about having a �fan club�. 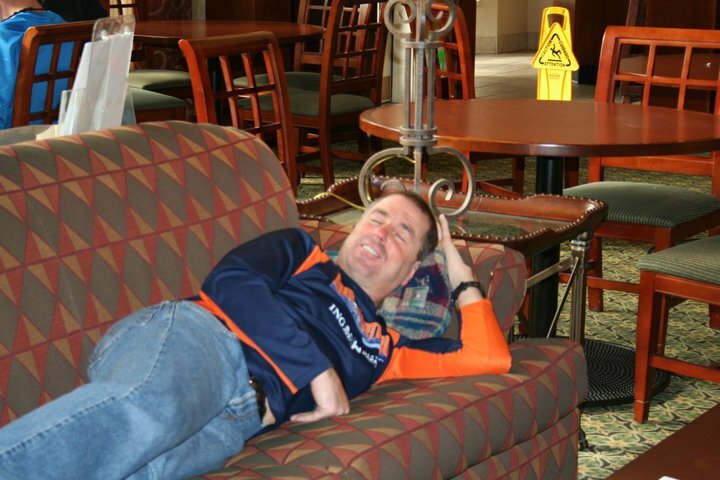 Once back in the room, I had to survive Smarty�s JoPa impersonations while we watched a Penn State game before lights out. We were up by 5:30am and Steve (designated Rebel Course Support person) dropped us off to catch a bus from the finish area up the road to the start in Bath. Arriving at the large, open lawn at 7am, we had plenty of time to enjoy a crisp and clear sunrise while waiting on line for the porta potties. I was wearing my racing shoes for their first run of more than 15 miles and opted not to do any warm-up jog. My left quad area had been sore for several weeks and I had no idea how it would hold up. 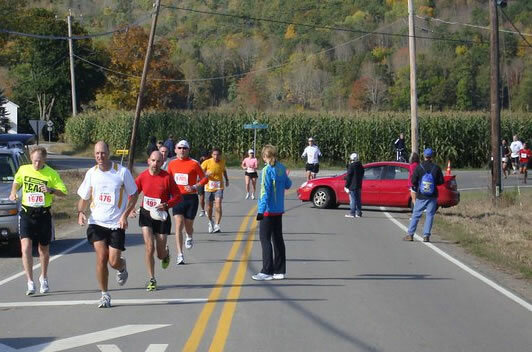 With 1600 marathoners and another 150 3-person relay teams, the starting area was wide enough to prevent loss of time. Conditions were near perfect, although ample sun made some of us wish that the point to point course was more shaded. Ryan started aggressively, with the 3:10 pacer. Rich and BBQ started with 3:30 group and I ran the first 4 miles with Smarty, until he pulled ahead of our 3:20 group. 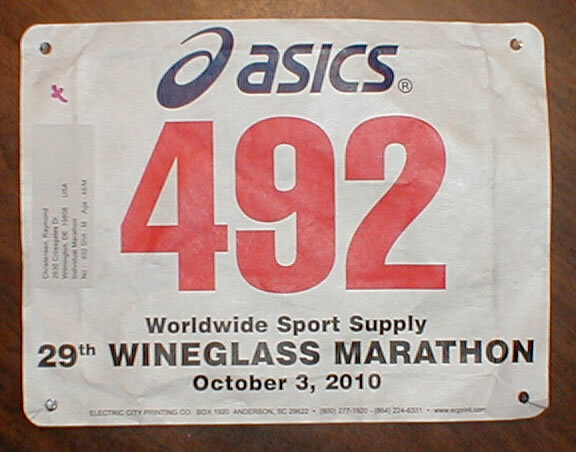 A few weeks prior, I had been gunning for a PR (3:13), but I was afraid that my leg wouldn�t allow it. Most of the course involves long stretches on quiet country roads, although one side was open to some traffic, so we had something else to keep us occupied besides the grass and corn fields, orange & red mountains, and occasional horses which watched attentively as we ran by. Water stations were adequate, with cheerful volunteers, although one in particular was a bit disorganized with water and Gatorade completely intermixed. 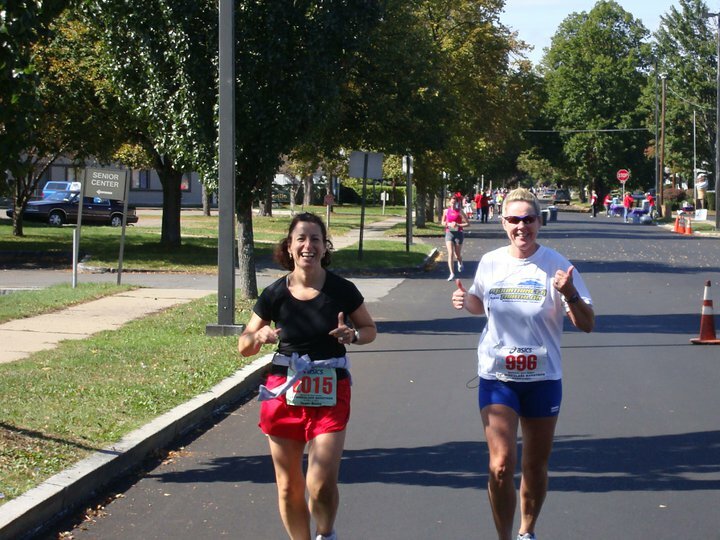 By the first transition area (mile 9), I realized that my sore leg would not be a factor. I was just ahead of the 3:20 pacer to avoid water stop congestion, but before the second transition (mile 18) the group slowly passed me. I caught up at the next water stop, but they soon dropped me for good. My legs started getting tight and I started to lose my stride. 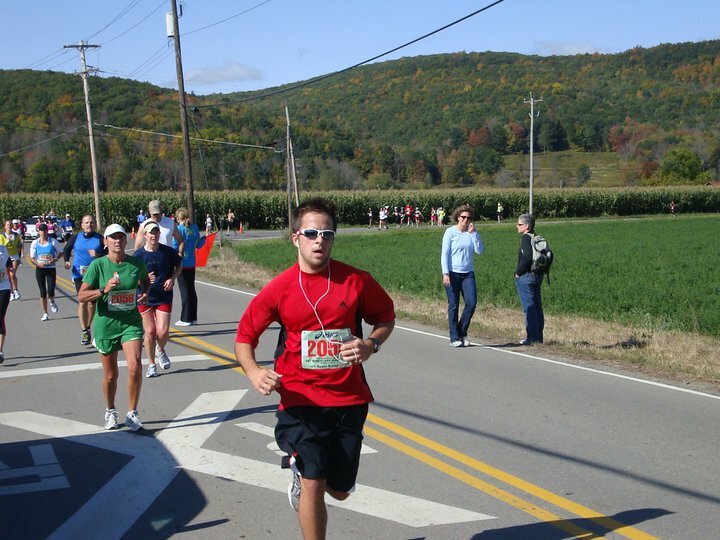 At this point I knew I couldn�t hold on for 3:20 and immediately focused on staying ahead of the 3:30 group. As it turned out, I barely did that! At mile 21, we went down a dip into a completely shaded path, which felt great and buoyed my spirits. 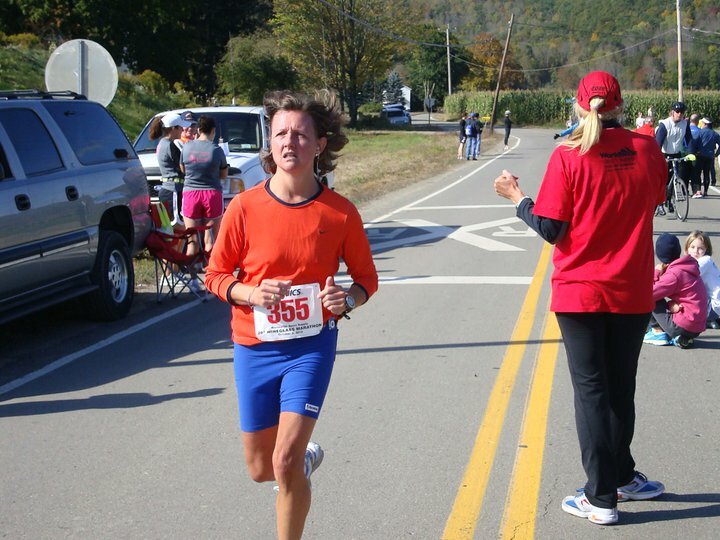 But my spirits were trampled upon with each runner that passed me. It felt like my [similarly fast course] marathon in Sacramento the previous year when I actually walked a couple times in the latter miles. I felt decent, but the legs were just not cooperating. [Bad legs!] At around mile 23, a little girl was jumping up and down with excitement on her lawn for each runner, which put a smile on my face temporarily. For the first time since mile 3, I started looking at my watch, nervous that the darn 3:30 group would catch me. It was uplifting to see the footbridge which served as a final stretch to the finish line and I found something resembling a running stride as I crossed the line with a chip time of 3:29:32. Tuckin: hat on... hat off. 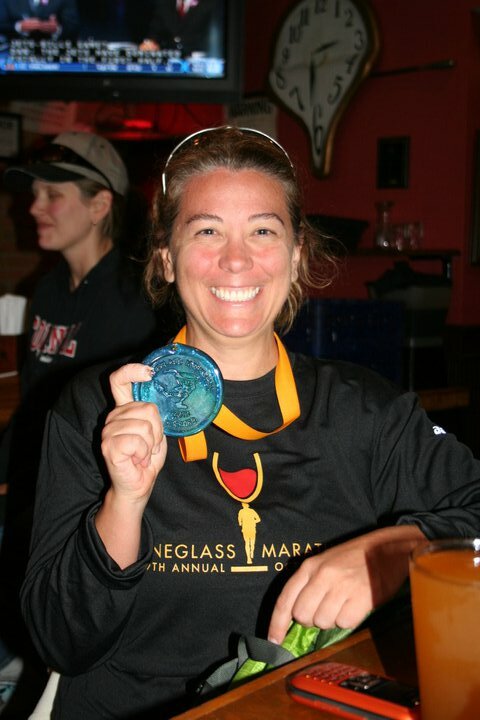 Upon receiving my foil blanket and glass medal, I realized how hungry and thirsty I was. 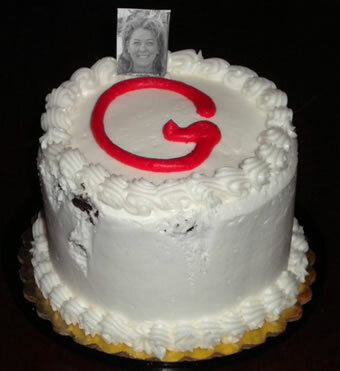 The 2 course GU�s I took were a bare minimum of nourishment. After a couple unsteady steps, I enjoyed the warm sunshine and grabbed soup, pizza, an apple, cheese stick and diet coke before wandering around. Rich soon appeared and posted himself near the finish area to greet fellow Delawareans as they came in. Our group grew until everyone was accounted for. 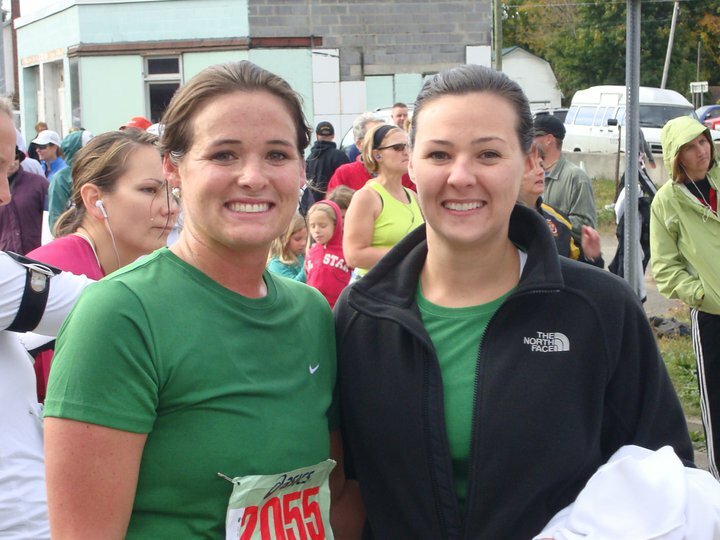 Two PCVRC members made their marathon debut: Gelsomina had tears in her eyes as she crossed the finish line in 4:53:16 and was immediately greeted by most of our group. Ryan German ran an impressive 3:19:46! Screech had her marathon PR, while the rest of us (Dar, Tuckin, BBQ, Sit Down) had to be content with the beautiful fall colors and enthusiastic spectators. 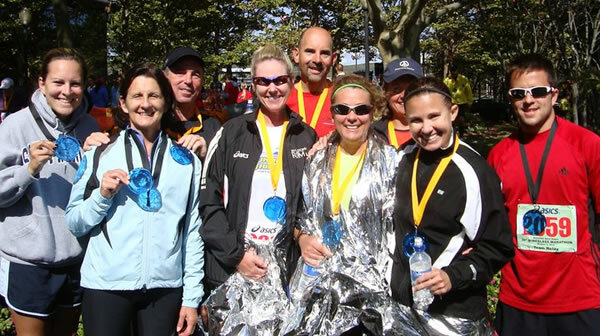 Cutter (+ her sister & mom), Lenora (+ her son & daughter), Smarty, Loco, and Barbara formed 3 person relay teams. 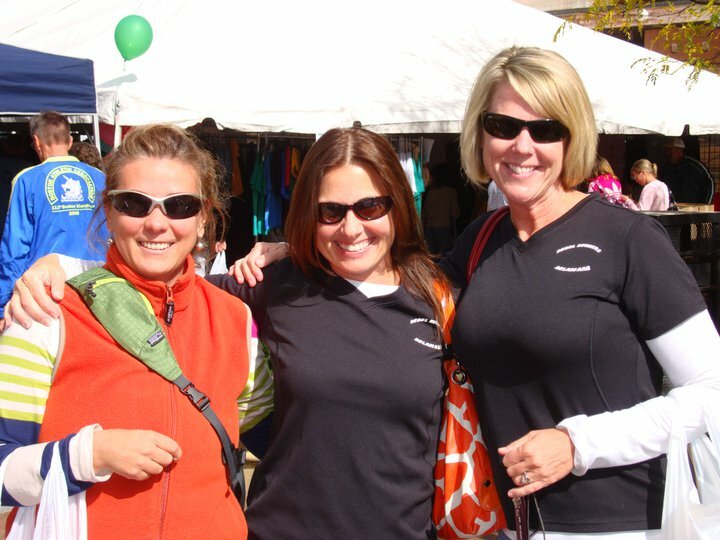 With 1486 marathon finishers, this charming and well-organized race will celebrate it's 30th anniversary next year. 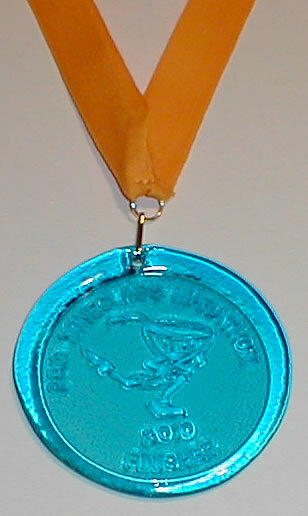 The unique glass medal, a wine glass and small bottle of champagne are additional enticements. 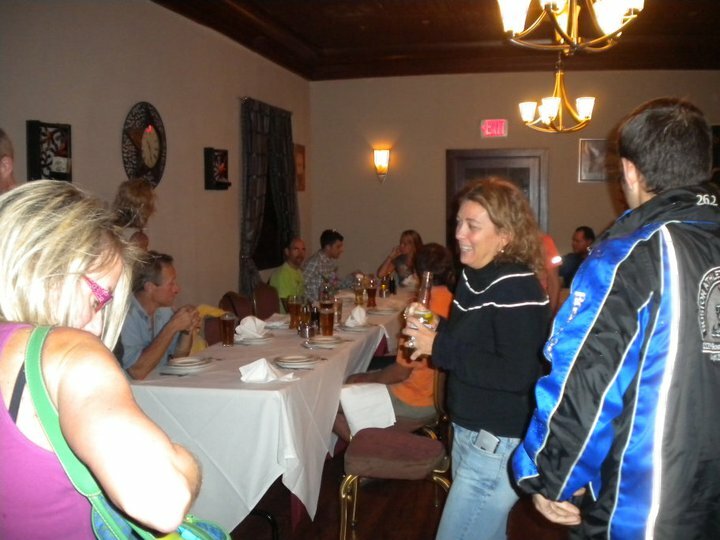 Most of us walked directly from the finish area to a Gaffers, local bar. Up to 20 Delawareans were at two tables across from the bar at any time throughout the afternoon watching the Jets trounce the Bills and the Eagles lose to McNabb and the Redskins. Rich led cheers whenever someone would walk in sporting a finisher medal. 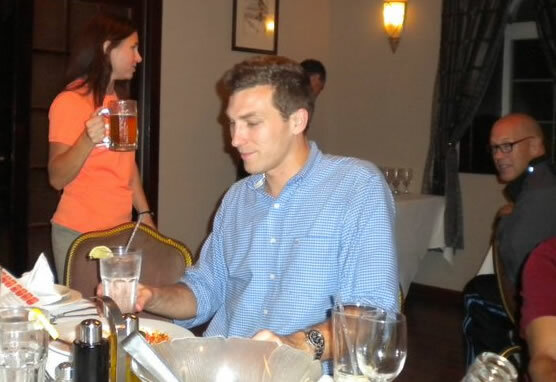 Some would hit the road that afternoon, while the rest of us finally headed back to the hotel after 6pm to shower.